Fall leaves of Rhus aromatica (‘Gro-Low,’ Fragrant Sumac). This vigorous, ground-hugging shrub makes an excellent ground cover, suckering and filling in areas quickly. 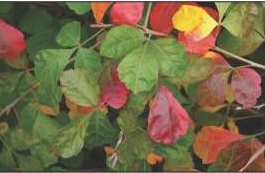 Its glossy foliage turns brilliant reds, oranges, yellows and purples in fall. At first glance, it may look like poison ivy (Rhus radicans), but Fragrant Sumac is not poisonous. It occurs more commonly in the mountains of the Mid-Atlantic Region than in the Piedmont. This entry was posted in MG in the Garden, Tried and True Native Plant Selections for the Mid-Atlantic and tagged ‘Gro-Low’ (Fragrant Sumac), Ground cover, Rhus aromatica, Tried and True Native Plant Selections for the Mid-Atlantic. Bookmark the permalink.